A week or so ago we had torrential rains! Friends a couple miles down the road measured 6.5 inches of rain in just a short few hours. For the most part, I stay out of the garden when things are this wet. But the day after the rain I was anxious to see if any of the stakes holding my tomatoes had fallen over. If that happens it may not unearth the roots totally, but disturbs them enough that the plants could put all their energy towards ripening the existing tomatoes and not producing more. That’s not necessarily a bad thing at the end of the season when there’s little time for new tomatoes to form, but August is way to early for that to be desirable. They’re a 59 inch length including the 14 inch prongs that go into the ground. They’re sturdy (to a degree) and hold a lot of weight. The description online at Gardener’s Supply indicates they’ll hold over 100 pounds. That sounds about right. The problem comes when it rains a lot and the ground softens. Then the stakes are prone to lean with the weight of the plant and its fruit. That can loosen (pull out) the roots to one degree or another. And that’s why I was anxious to get out and inspect after that rain. Could the Problem Be Avoided by NOT Staking? 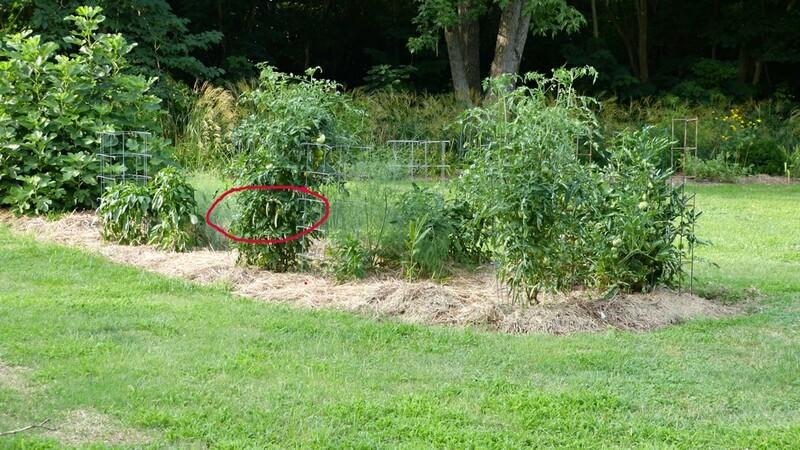 It could be avoided by not staking and letting the tomatoes sprawl. BUT, everything has it’s pros and cons. The first year I gardened I just let the plants sprawl. It only took that one season for me to decided I didn’t like that. First, it takes more space than I’m willing to give. Second, I got tired of crickets and slugs feasting on tomatoes laying on the ground. That can happen with staked tomatoes too, but seldom compared to when plants sprawl. 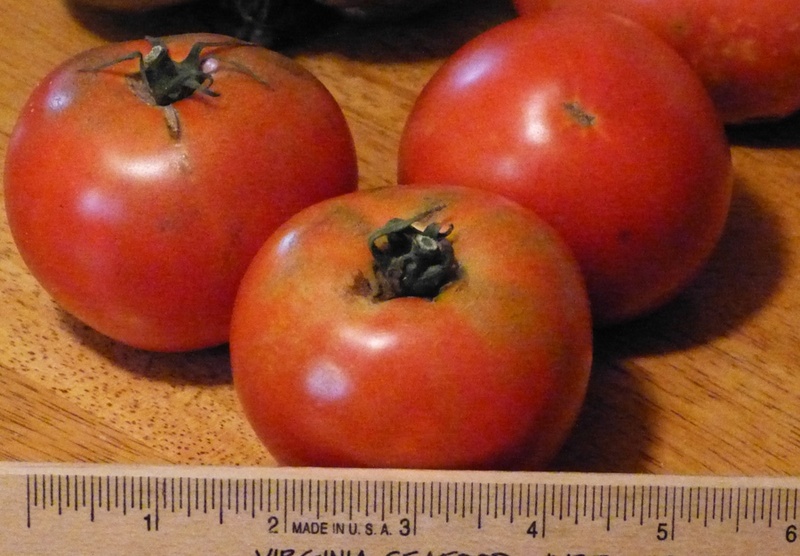 The 6.5 inches of rain we had the other week did not affect the taste of my tomatoes. Nor did it cause any splitting. If we were to have days of that, I’d be concerned. 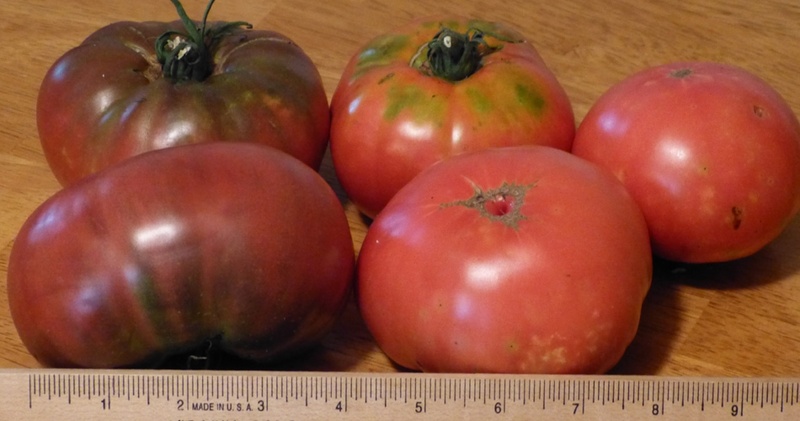 Also, keep in mind that some varieties are more prone to splitting than others. Those might need to be picked before the rain. 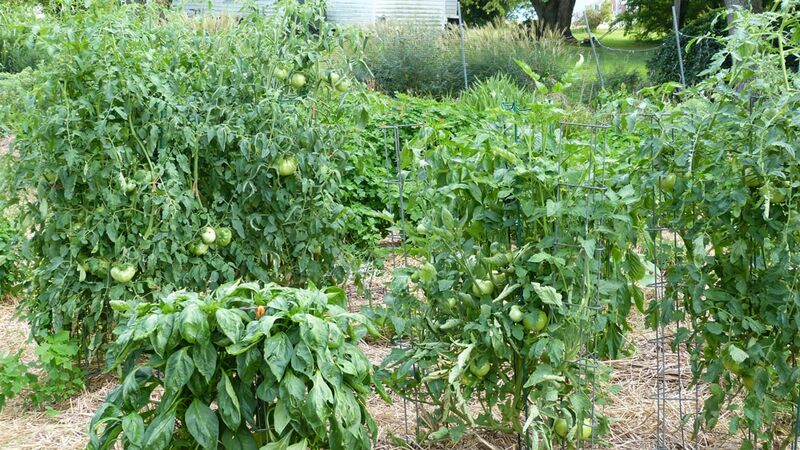 Tomato plants and pepper plant in garden. Tomato plants usually get very large. I only prune when a branch is getting in the way. Or maybe at the end of the season when I know that there’s no time for new fruit to develop. By the way, these stakes are perfect for pepper plants. Use the 59 inch ones for peppers that get about 4 feet tall. Shorter ones are available for peppers that grow only 2 1/2 to 3 feet. 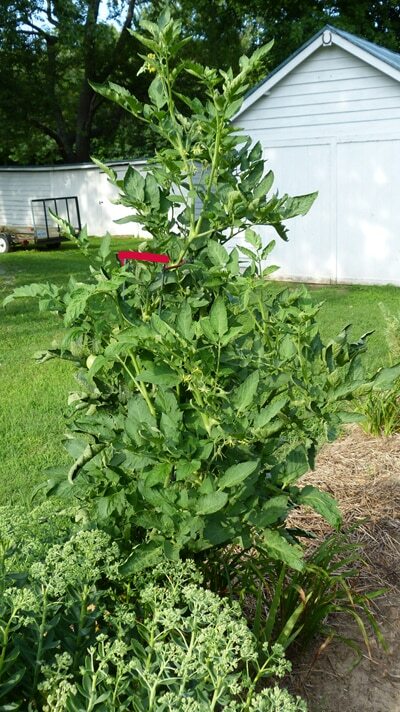 One stake and one plant – the exception. Just to have a tomato close to the house I planted this one in the worse possible spot. In spite of that, it’s a gorgeous plant, but just didn’t grow a lot of foliage like the ones in the garden. The red mark is where the stake ends. Some tomatoes and peppers in the small meadow bed. 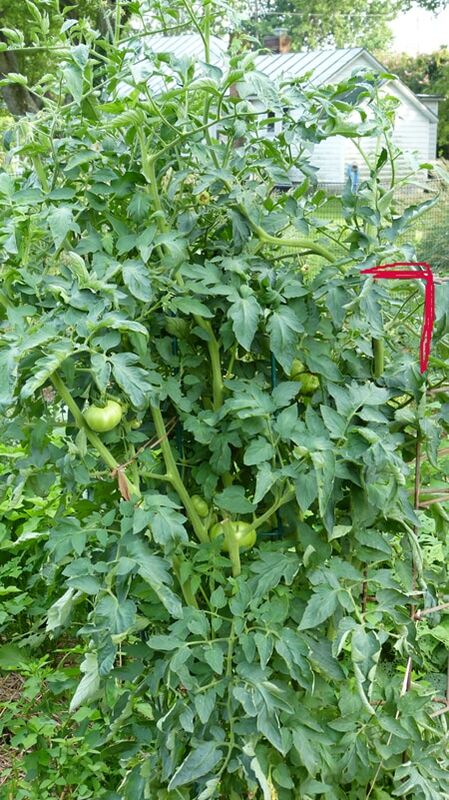 I found a huge tomato concealed in the foliage where I’ve drawn the red circle. Its picture is below this one. My old scale is about an 1/8 of a pound off. 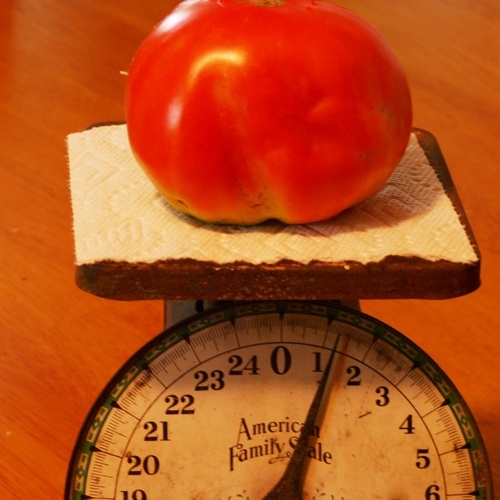 The tomato is only a little over a pound. It too is the open pollinated Big Beef. but just a lot bigger than the other 3 from the plant in the poor spot. The ways to stake tomatoes are probably endless, but below I’ve mentioned two that really appeal to me. If I were just starting out, I’d think about trying one. They’d be more secure than what I have and not require the constant vigilance over the entire season. T-posts were driven two feet into the ground and he’d weave the wire cylinder over the posts to hold it upright and secure. Never had trouble with wind and heavy rain causing them to fall over. I don’t have the room for this method, but I like it a lot. T-posts go in the ground every 5 to 10 feet for the length of your row. A utility panel (available in various lengths and widths) is then secured to the t-posts. Tomatoes are planted every 2 or 3 feet. Each plant can be tied to the panel after it’s about a foot or two tall and then it’ll take care of itself. No need to worry about more tying or pruning. The few branches that end up on the ground are not much of a problem. You can leave them or cut them off; whatever you prefer. Because of the cold in May, I didn’t transplant tomatoes into garden beds until the last day of May and the first week in June. Needless to say, I was into mid July before getting a tomato. I’ve drawn red over the top of the tomato stake so you can see how the plant towers over it. From inside the garden looking out at one of the borders. I enjoy the beauty and long bloom time of this Heliopsis each year. This is a timely post, Theresa! We have had a lot of rain here, off and on. The last round was too much at once. I haven’t been doing my bug patrol for a couple of days and know there will be many harlequin bugs to contend with when I get back. 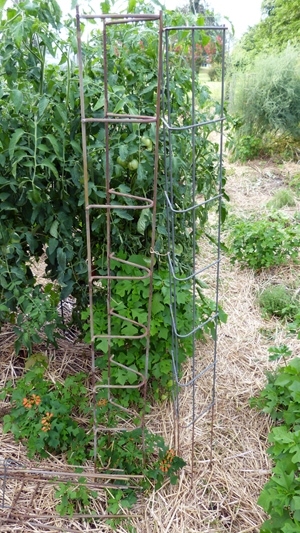 I use these same steel tomato ladders. I have had to tie or lean them to a nearby fence or other support to keep them from falling over when the ground gets saturated. But all in all, I am pleased with their performance. We have had them for many years. I love the cattle panel suggestion especially since I usually have extras laying around. It was good to see you post again. It had been a while. Thank you for sharing! It is good to see another post. I haven.t got as many tomatoes the last 3 years on my plants. Also, I love the black or purple tomatoes, so I tried Prudens purple this year but don’t see any purple tomatoes. Your garden is just gorgeous! I love seeing pictures of it…and you know I LOVE tomatoes. Thank you for this post! I don’t have to tell you how badly I’ve missed your posts. You already know! With two jobs & babysitting the Grandkids in between, my garden had gotten weeds & tomato hornworms! Youngest grandchild is the perfect height to spot the hornworms & found 2 within seconds! 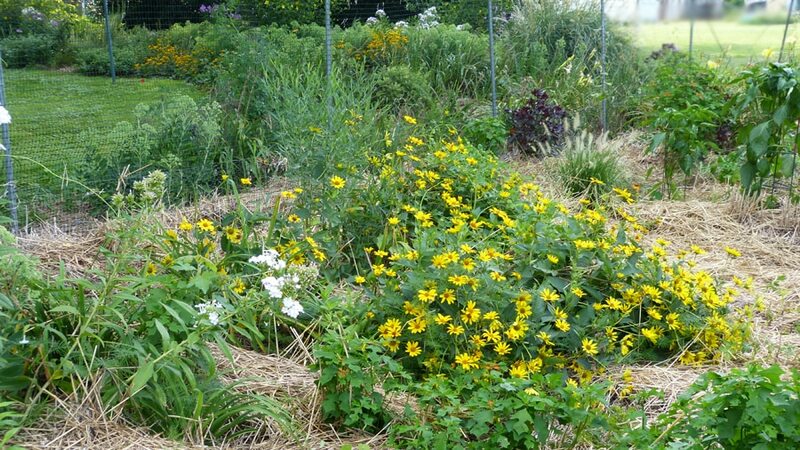 If the ground isn’t too wet, my plan for today is to dig my potatoes, plant more dill, and get tomato, pepper & various other plants into the garden that have been patiently waiting on the back deck. Already planning for Alfred to construct some LARGE planters for the back deck for next summer. He rigged up the neatest faucet with a straight handle on the deck railing so that I can turn the water on/off easily, even when my arthritic hand/wrist is acting up! I’m very excited about the idea of stepping out of the back door & grabbing tomatoes, cucumbers, squash, herbs, etc for a quick dinner! I missed your posts SO MUCH!!! Still wishing we lived closer. Praying your days are brighter. Hi Theresa, so good to hear from you. My Spring garden was great up until May when rats (Florida has citrus and roof rats) decided I grew delicious tomatoes. I got a handle on them and then when I took a short trip, Thursday to Sunday, my sister came to stay at my house and took care of my dogs but forgot to water my garden. It was 96 each day and we were in a drought until June. The over two dozen tomatoes on the vines died by Sunday when I got home. It was sad but I am looking forward to a Florida fall garden. I have buckwheat growing right now and I’ll turn that under at the end of the month. I hope to plant late September. Your gardens are always so beautiful to see, wish I had more room. I will add on to mine this year. I would like to try a hand at potatoes. Do they grow well in the same garden with tomatoes? My tomatoes that were fed too much wood ash got very healthy. A little late but very healthy none the less. Having probably the best looking plants ever for this time of year and still producing tomatoes. The most ever in my short gardening career. So all in all putting too much wood ash was not as bad as it could have been. Thanks for your helpful advice I would have done something stupid more than likely without your advice. Pat, I was glad to see your comment. It’s been a while since we “talked” via email. Julie, gardening with rattlesnakes has got to be the greatest of challenges!! Don, hope those Prudens purples will give you some tomatoes before it’s over. Patricia, yes, I know you love tomatoes! Toni, I’m so glad you enjoy the photos. Betty, I hope I’m really back and that I can post on more regular basis. Bonnie, sorry for the delay in replying to your question. The answer is yes, potatoes can do very well in the same garden with tomatoes. Steve, that was quite an experience you had. So glad things turned out well. That was due to your perseverance in trying to save them! And you did!! Thanks all for comments and welcoming me back. I’ve had a terrible year(again) with early and this year late blight on my tomatoes. Do you know of a solution that would get rid of this disease that seems to over-winter wonderfullyin my garden. Is there an organic treatment that I could use on the soil now to get rid of this awful tomato ruining disease? I’ve about given up trying to grow them in my garden and instead just put them in pots on my deck! Sandy, I’m so sorry to hear of your tomato disease problems. I’ll suggest the following 3 posts to hopefully answer your concerns. Let me know if you still need help after reading them.